Here is some advice to guide you on how to deal with health problems arising when the surgery is closed. At any time of the day, assessment at the Accident and Emergency Department is usually required for most accidents and injuries. Severe chest pain, strokes, loss of consciousness (coma), breathing difficulties, fits and haemorrhage (bleeding) usually requires immediate attention and ultimately hospital treatment. We would therefore suggest that you ring 999 immediately. Do not use A&E for non-urgent or less serious conditions. For vomiting, ear ache, tummy pain or back-ache – or complaints that don’t get better within 24 hours – ring the Out of Hours Service 111 or ring your surgery and your call will be diverted. For diarrhoea, runny nose, a painful cough or a headache, please see your local pharmacist. If you are hung over, suffering from general day-to-day wear & tear, please choose self care. 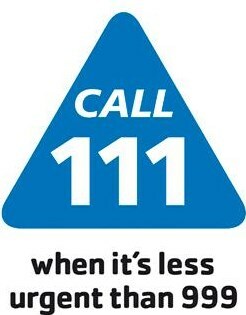 If you are unwell but are not sure what to do, please call 111. …and then please only go to A&E at St Richard’s in an emergency. For Dental emergencies, you should contact you own dentist or 111. If you require a GP out of hours, please ring 111. You will be offered either; advice, a consultation at our base surgery at the Bognor Hospital or St Richards Hospital, or a home visit if this is necessary. Emergency surgeries are run at the Bognor Hospital on Saturdays and Sundays and St Richard's Hospital in the evenings and at weekends. You will be strongly encouraged to attend the out of hours base if at all possible. If the doctor deems a home visit necessary, they will attend in a specially equipped car. Particularly at night, please look out for the car if it is expected, and ensure that your house is well lit. Please try and avoid contacting the service unless the problem is urgent and genuinely cannot wait until the surgery is open. Non-urgent calls delay the duty doctor and distract them from giving care to those who really need it.